I believe the earth will survive us. It has survived far worse than us. Its 3.5-billion-year life history is a gauntlet of apocalypses. In every ancient crater and dinosaur fossil bed, you see a story of global endings. Whether we survive ourselves is more the question. And what of most other living things? Will they survive us? I'm not willing - or even able - to wait the 6 to 10 million years it would take to return to current levels of biodiversity. That's how long global mass extinctions have taken to recover in the past. Key indicators point to us being in such an extinction right now. So, you have to ask, what comes next? The most likely scenario, or at least the most hoped for, is that the planet remains generally supportive, and climates are stable enough we get to keep our pretty cities and bucolic countryside. How long, though, can that hold? How long will this planet take the sharp stick in the eye of human landscape change, and the overturning of atmospheric and marine balances? There can be no doubt that we as a species deliver a global punch. With mountains mined and rivers dammed, weight balances in the earth's crust have detectibly changed, altering the speed and direction of tectonic movement. That is to say nothing of the industrial tinkering we do with air and water that changes not only temperatures and storms, but what we breathe and drink. Earth's history shows that climatic swings can come fast and hard, certainly hard enough to put a stop to the likes of us. Knowing this, how much can we afford to ignore at full steam ahead? How long do we wait until we wished we had done something different? "An elegant and absorbing account of just how violently the earth can change...this is a very good book to read as we start to watch global warming provide a new shock on this scale." planet . . . Childs's lively writing reveals awesome, otherworldy landscapes. "Childs aims to experience the apocalypse first hand...Gripping descriptions of deteriorating ecosystems that may soon require less travel and perhaps none at all for readers to experience. 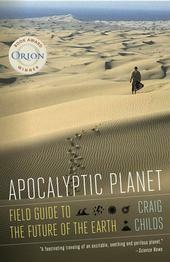 "Craig Childs takes an Edward Abbey-esque journey across our rapidly changing globe. Apocalyptic Planet is lyrical, informative, and full of surprises. "It is impossible to read Craig Childs and see the world in the same way again. ), he immerses himself in parts of our world that scientists endlessly study but we willfully ignore. He consults great minds, cajoles friends into sharing his adventures (with often hilarious results), and brings his mother along in an attempt to gather clues and form conclusions about the end of the world as we know it. Surprisingly, this is not a work of darkest sorrow but rather an engaging exploration of the land beneath us and the sixth mass extinction that scientists agree is underway."